It was another perfect spring day, sunny, a light breeze was blowing making it cool enough for a light jacket. We have been wondering for a while where Sparks Road ended and today was the perfect day to find out. Harley got out the motorcycle and off we went. Sparks Road is a beautiful one lane dirt road with modern cabins on either side of the road and large tracts of land in between the homes. We were admiring the view when we happened across one of those jaw dropping gardens. I told him his garden had taken my breath away and we were just stopping to admire it was that OK? He joyfully invited us in to view the beauty up close. Thirty years of careful tending had yielded quite a large garden with flowers, clematis, poppies, money plants, peonies, verbena, nasturtium, roses of many colors and varieties, blooming bushes and small trees. Some of the loveliest flowers were from vegetables and spices. 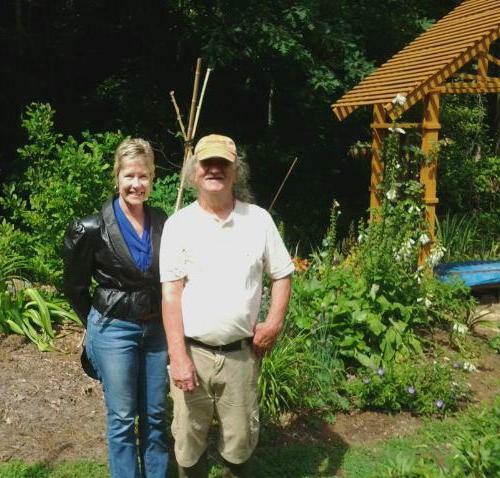 Neil had just decided to let them bloom, things like garlic, chives, and asparagus just beautiful, so creative. 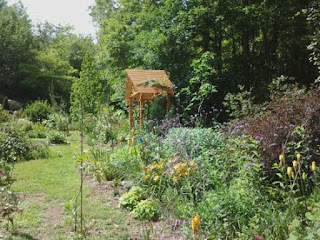 He had arranged stepping stones in an inviting way to guide you on the walk through parts of the garden, he built a gazebo from a photo he had seen in a magazine with a fire pit in front to dispose of yard waste. His home was modest, he and a friend had built it 20+ years ago, and his joy in life is tending his garden and propagating and planting new flowers, vegetables, and trees. The big menace he and the garden faces are the hungry deer on the hill. Apparently, they look at Neil’s garden as a beautiful salad bar. The solution was to put electric wire around the quite spacious garden. He told me they just know to stay away when it is on. We have been invited to come back when we return in the fall, he said everything blooming now will be gone and an entire new shock of colors and textures will be available, he has patches of mum’s growing that are as big as my car, I can’t wait.